Integrated Device Technology has announced the availability of its new ZWIR4532 connectivity module, which is FCC certified and provides the critical and secure 6LoWPAN wireless connectivity to link devices to the Internet of Things (IoT). The ZWIR4532 is a complete and full-featured IoT connectivity module, incorporating an Arm® microcontroller, a sub-Gigahertz radio transceiver, and optional license-free IDT firmware download. It is an excellent solution for IoT connectivity thanks to its support for native communication with computers and mobile devices through IPv6, the ability to create self-healing ad-hoc mesh networks for covering large areas and long ranges, and secure connectivity based on open standard security protocols. The module is also ideal for battery-powered devices as its low power requirements maximize battery life. IDT also provides the optional SensorShare™ firmware, a 6LoWPAN open standard stack that communicates natively with IPv6 over IEEE 802.15.4 radio links, which has no associated license fees or royalties, to enable customers to focus on their applications without the burden of building IoT solutions from the ground up. 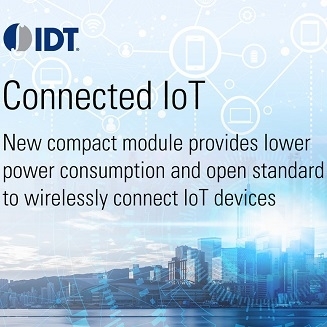 IDT's ZWIR4532 6LoWPAN wireless IoT connectivity module is currently available. For more details, click here.